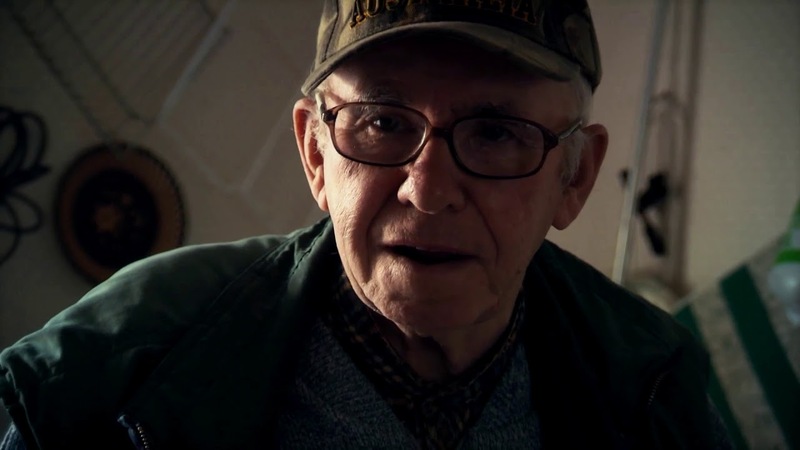 The Man Who Wanted To Fly – Film Review by Frank L.
This loving documentary unearths the quiet but rich life of two elderly, bachelor brothers Ernie and Bobby Coote, who live near Bailieboro, County Cavan. Their formal education was in an unloving local school which they left when thirteen. It luckily has not damaged their ability to dream. Both of them, in different ways, allowed their imaginations to carry them much further afield than the confines of their townland where they passed, firmly rooted, the vast amount of their eighty years plus. The film begins by Ernie praising his younger brother Bobby as a genius who Shouldice shows us fixing a clock. Ernie’s dreams lie elsewhere as he pursues as a HAM shortwave radio operator his need to encounter distant and foreign parts. He has done it for years and has postcards from all over the world meticulously assembled in albums to prove it. It is Bobby who has always had an ambition to fly free as a bird. In his early eighties he is heavily involved in making his life long dream become a reality. There are many obstacles to overcome but he is determined. He does not have a suitable field in which to land an aeroplane but a neighbour does. Then there is the acquisition of a plane, the building of a hangar and the certification of the plane as airworthy are further obstacles to surmount. Even more important is the necessity for Bobby to learn how to fly a light aircraft. All of this requires scheming and dreaming and ,of course, patience. It is a wonderful tale that emerges. Ernie is thrilled but a little bit sceptical by the madness of it all while the immediate neighbours are supportive. Meanwhile Bobby, himself, keeps his feet firmly on the ground as he practices another of his skills, that of being a fiddle maker. He does so by using timber from discarded pieces of furniture. Here is a man proud of his own craftsmanship which is attested to in the careful manner he signs his name on the finished fiddle. The filming of this delightful insight into quiet rural lives took place over five years. While Shouldice has naturally made Bobby the centre piece, his brother Ernie is also worth listening to carefully. But what is also evident is the love and respect which these two elderly men generate in their community. Light aircraft and amateur wireless operations are creations of the twentieth century. These two men have watched the trajectory of these two inventions with light aircraft becoming commonplace and amateur wireless becoming more esoteric. But these two mean show that the paucity of their education and the limited advantages they have been given have not restricted them in their ability to dream so as to enhance their lives and enrich them. Shouldice has created a beautiful film that celebrates many things. The deep friendship and respect that two elderly brothers have for each other, their individuality, their confidence in their own rural, generous community. It is a celebration of the imagination which can flourish anywhere. Rural county Cavan, in the vicinity of Bailieboro, is from where these flights of fancy soared. They became reality. However, Bobby Coote clock repairer, fiddle maker and aeronaut is an impressive man full of curiosity, wisdom and courage. He is a wonder to behold ably supported by his brother and community of which they are such an integral part. Shouldice is entitled to take many bows for this gem of a documentary.